Hello VS Readers! I hope your virtual bags are packed! 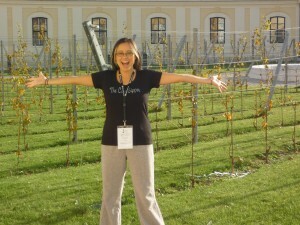 I am about to take you on a virtual trip to the European Wine Bloggers Conference (EWBC) 2010 in Vienna, Austria! Oh, and get you your virtual liver ready too! hahaha! 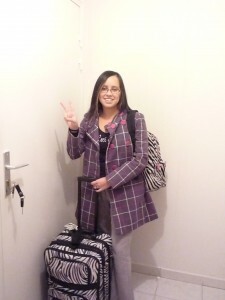 No internship is ever easy, but my internship became particularly difficult when I showed up at 6am at the train station in my little French town I live in and ….. ALL TRAINS WERE CANCELED DUE TO STRIKES! Yes, the French were at it again! This time they were striking because the government wants to raise the retirement age from 60 to 62 and the full state pension age from 65 to 67. My opinion/rant on the matter aside, I had no idea HOW WAS I GOING TO MAKE IT TO PARIS TO TAKE MY PLANE !?! I fell into a state of desperation, depression and frustration! I had checked the internet a couple hours before my departure time to make sure my train was leaving as scheduled … I suppose it is too much to ask to have instant online updating of transportation delays? – I’m a GenY-er, what can I say? 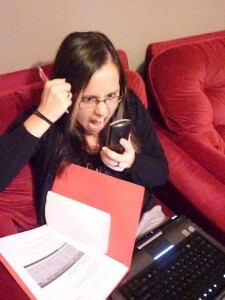 That is me wanting to telephonically hurt people that made the first leg of this trip a nightmare! Long story short, the french company would do nothing for me … BUT a very helpful representative at Austrian Airlines was able to get me rebooked for the next day. WHEW! Frenchie le Boyfriend then drove me the 2.5 hours to Charles de Gaulle Airport (gas strike and all!) in the middle of the night. 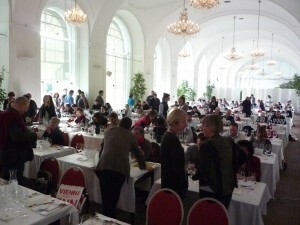 I slept in the airport for 8.5 hours, boarded the plane at 10am, arrived in Vienna at 12:30pm and THEN … to the EWBC by 2pm! Ahhhh! 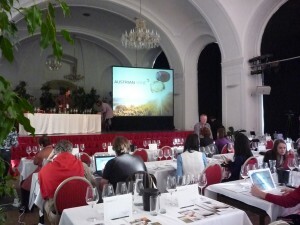 Finally at the EWBC and ready to go! Here is a long shot of the main conference hall. 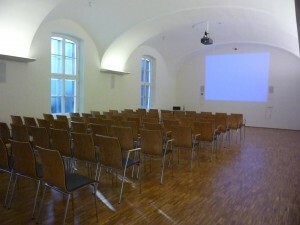 The inside views of the main conference hall, called the Orangerie. 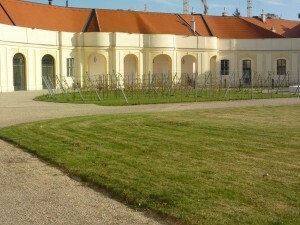 A shot of the area where the wine exhibition, lunch, and smaller workshops were held. After playing Cattle Herder, it was finally time to throwback taste some of that Austrian nectar!! 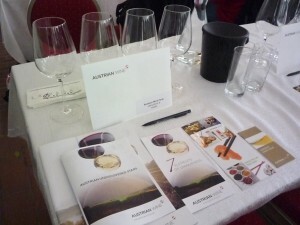 The Austrian Technical tasting was up next! The EWBC Organizing Trio opened the session: (Left to Right) Ryan & Gabriella Opaz of Catavino and Robert McIntosh of Wine Conversation. 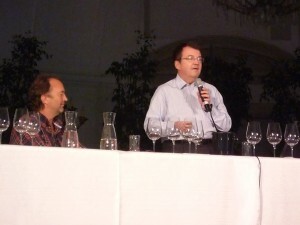 The speaker for the tasting was the president of the Austrian Wine Marketing Board, Willi Klinger. He was such a charismatic person and definitely a ‘life-of-the party’ kind a guy. If Austrian wine sales are up … I think it has a lot to do with this man’s personality! He is not afraid to have a rockin’ good time! Next to him is Rowan Gormley, Founder of Naked Wines, a UK based online wine retailer. He was there to take a poll from the audience and the Austrian wine from the tasting that won ‘crowd favorite’ would be made available for sale on NakedWines.com as their first Austrian wine! For the red wines we had a wine from each of the indigenous Austrian varietals of *Zweigelt, *Blaufrankisch, *St. Laurent and we finished with an Austrian Pinot Noir. Our 11th wine was a sweet wine (*Category of Sweet Wine: Ausbruch) made from the Chardonnay, *Weissburgunder (aka Pinot Blanc), and Sauvignon Blanc varietals. 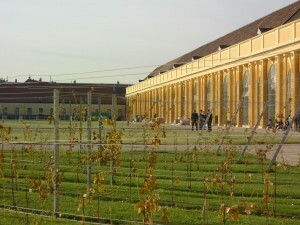 If you want to know the specific wines we tasted above (and see some tasting notes on them from participants) you can view them here on the “EWBC 2010 Vienna – Austrian Wine Tasting” Adegga page – a social tasting note site. Now for those of you who are feeling a bit intimidated with the Austrian wine lingo used above … I will end this post with a bit more explanation for you. For those of you who know about Austrian wine, or were just enjoying the photos from my trip, you can duck out know, lol. For Day 1 – Let’s start with some pronunciation and basic facts of the indigenous Austrian varieties above. 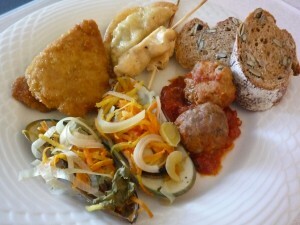 This will help prepare you for the coming day’s EWBC posts. Gruner Veltliner – (groo-nuh velt-leen-uh) – aka ‘GV’ this is Austria’s leading grape variety (30% of Austria’s vineyards) and is a very versatile white wine variety with styles ranging from a light, refreshing summertime wine to a sweet, noble rot inflicted nectar! The various styles of this varietal are also magical when paired with various Asian cuisines! 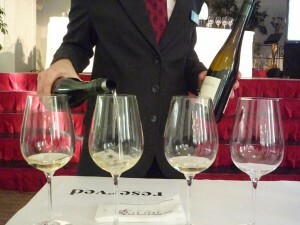 See the Austrian Wine Marketing Board’s Asian Cuisine PDF Brochure for pairing ideas! Gemischter Satz – (guh-meesh-tuh sots) – aka a traditional Viennese white field blend – aka a wine made from a blend of grapes that are grown together in the field, and then picked and fermented at the same time. Zweigelt – (zv-eye-gelt) – a variety made from crossing the Blaufrankisch and St. Laurent varieties. 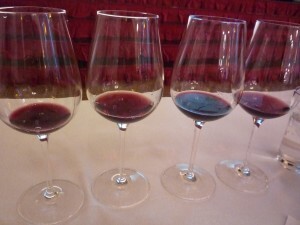 It is the most widespread red wine variety in Austria. Range of styles from easy drinking, fruity, unoaked wines to rich and full-bodied aged in small oak barrels. It is also used as a blending variety with its parent varietals. Blaufrankisch – (blou-frenk-ish (‘0u’ as in ouch)) – the prominent red wine variety of the Austrian wine region, Mittelburgunland. Its typical characteristics include aromas of forest fruit, cherry, herbal spices, a lively acidity and a wine that is fit for aging. St. Laurent – (sankt lou-rent (‘0u’ as in ouch)) – a red wine variety belonging to the Pinot family, which explains its neediness in the vineyard. It is named after the August 10th St. Laurent Saint Day, the day the color of the green berries begin to redden aka veraison (pronounced: vare-ray-zohn). The typical aromas of this variety are blackberries, sour cherries, and plums; when it matures you find more stewed berry, spice and chocolate aromas. Weissburgunder – (vice-burgunder) – (aka Pinot Blanc) a white wine variety belonging to the Pinot family, that was used in the blend of the sweet wine we tasted above. When made with no oak this variety offers light floral, apple and herbaceous aromas. When allowed to overripen for use in sweet wines, aromas of baked apples, nut, spice,and almond with racy acidity can be found. 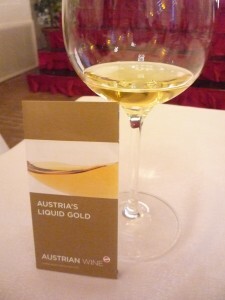 Category of Sweet Wine: Ausbruch – (ouss-broo-kh (‘0u’ as in ouch)) – This category of Austrian sweet wine requires that the wine come from grapes that are completely overripe, naturally shriveled and affected by noble rot. 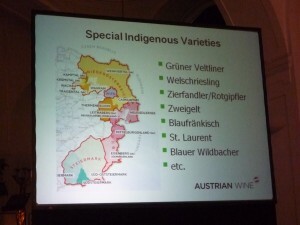 Now that is most certainly not all of the Austrian indigenous varietals, just the ones I mentioned in this post. 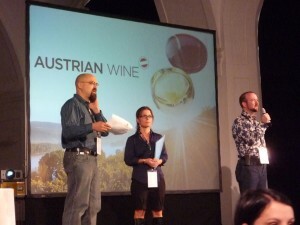 It took me 5 intense days to become an Austrian Wine Ambassador =) so bear with me, after my series of EWBC posts, you are going to feel a lot more confident when picking out a delicious Austrian wine to enjoy! See you on the next post about the evening’s festivities of EWBC ’10 Day 1!! Previous Previous post: Project Wine Blog: My Challenge #6 – Winery Road Trip! Hope you have a blast, and well, sometimes the best travel stories start with a series of disasters. Perhaps one day I’ll tell you about the 1987 Boy Scout trip to the Grand Canyon and you’ll see me weep heavily over a glass of Syrah.